The Witcher 3 is on the market several weeks now and many players will have already seen the end flicker including credits on the screen. 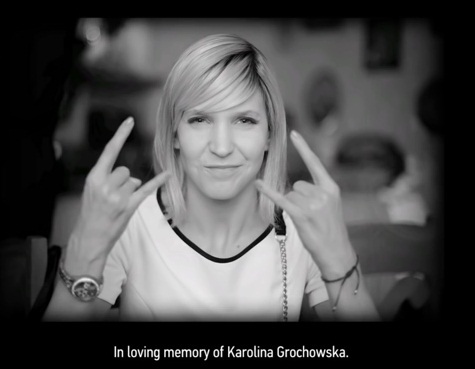 Complete the credits through the special dedication "In memory of lovely Karolina Grochowska". The question might ask, actually who is Grochowska. Karolina Grochowska from the Polish Warsaw belonged to the huge team that was responsible for the work on the Witcher series. How does the message can already be found, Grochowska is unfortunately died with cancer while working on the lush RPG in October 2014. This was preceded by a four-year-long phase of the disease, in which, among others, one of her legs had to be removed. - Karolina Grochwoska worked for many years in the games industry. - In 2011 she worked, among others, the implementation of Bulletstorm. - Her other projects have included Gears Of War Judgment and of course The Witcher. - Since May 2007 Karolina Grochowska was actuated for CD Projekt RED. - 2008 From September Grochowska responsible as a producer for the team of 35 people who worked on The Witcher 2. - Previously, she led the work on The Witcher Enhanced Edition. - From July 2009 Karolina worked for Epic Games Poland. - On October 1, Karolina Grochowska died after years of illness. The credits at the end of The Witcher 3 You can watch the video here. The display commemorating Karolina Grochowska takes her from 13:00. The Linked guy does not contain spoilers, but only the names of the employees involved in The Witcher 3. If you have not yet made it to the end of the game, we have tips and tricks for The Witcher 3 ready for you. In addition, you will find a guide for the card game Gwint and you can also learn all alternate endings in The Witcher 3.